Dr. Rob Stone was a teenager in Southern Indiana when he felt the call to become a physician. It began during a stint as a counselor at a camp in Tell City for children with disabilities. An Ivy League education and career as a doctor followed. Then, decades later, came a second calling: He became an agitator for changing the nation’s health-care system. the clinic that serves the uninsured. Stone, an emergency room physician at Bloomington Hospital, has emerged as one of Indiana’s most outspoken advocates for making insurance accessible to all. He is co-founder and director of Hoosiers for a Commonsense Health Plan, which contends that the current system is too profit-driven, too inefficient, and leaves too many people without affordable access to health care. HCHP — made up of doctors, nurses, social workers, patients and others — is an affiliate of the national Physicians for a National Health Program. From its founding in September 2005, HCHP has grown from a small band of advocates to a statewide citizens group with dozens of active volunteers and an e-mail list of more than 1,500. Stone, 55, said his motivation stems from his many years of seeing the struggles of patients needing care. Stone brings that message to Indianapolis today during a public forum titled “Understanding the Health Care Crisis: Problems and Solutions,” which runs from 9 a.m. to noon at Indianapolis First Friends, 3030 Kessler Blvd., East Drive. One of Stone’s favorite targets is Indiana’s largest health-care insurance provider, Indianapolis-based WellPoint, a $61 billion health insurance giant that provides coverage to 35 million people in America. Stone’s PowerPoint presentation lays out his case. A Medicare-type program for all is better than the current system, he says. Medicare is currently for the elderly. One slide — with information attributed to the International Journal of Health Services in 2005 — shows Medicare overhead spending was 3.1 percent of its budget, compared with 26.5 percent for investor-owned Blue Cross and Blue Shield plans. Another slide — with information from the Employer Health Benefits Annual Survey and Bureau of Labor Statistics — showed that from 2000 to 2006 health insurance premiums rose 87 percent while workers’ earnings rose 18 percent. 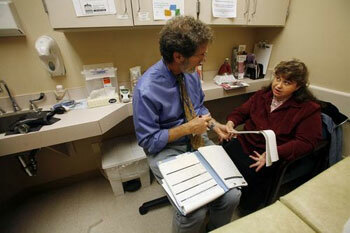 About 47 million Americans, including 750,000 Hoosiers, are without health insurance. It’s a complex and uphill battle. ” ‘Single payer’ is not a phrase that is rolling off anyone’s lips in the presidential race, with the exception of Dennis Kucinich,” said Alwyn Cassil, director of public affairs for the Center for Studying Health System Change, a Washington, D.C.-based research group. Many Americans, she said, tend not to be interested in what they consider a government solution to the health-care crisis. Cassil said hospitals, insurers, device makers and many doctors benefit from the current system. But Stone does have some allies. Physicians for a National Health Program was founded by two Harvard professors of medicine, David Himmelstein and Steffie Woolhandler, and has grown to more than 14,000 members. “They’re a very dedicated, committed group,” Cassil said. Groups like Stone’s, while small in the number of physicians who take part, are credible advocates because they’re out on the front lines of medicine and often stand to lose income if the reforms they seek ever become reality, Cassil said. For its part, WellPoint sees having a competitive, free-market system as key to improving the quality of care and controlling costs. “We believe a single-payer health-care system would hinder progress in these areas by eliminating competition and restricting patient choice and could require patients to endure long wait times for care while possibly reducing the quality of health care,” WellPoint spokesman Jim Kappel said in an e-mail. In its recent earnings report, WellPoint touted that it lowered its administrative expenses to 14.5 percent of premium revenue in 2007 from 15.7 percent in 2006 even as it added 708,000 members. The company also pointed to flaws in other nations’ health-care systems. Stone stands by his position. He recalls a patient who refused to seek treatment for chest pains that turned out to be a heart attack. He finally sought treatment for a second attack, only because the first attack left him disabled — but now eligible for government coverage. The physician has scaled back his work at Bloomington Hospital to two shifts a week to devote more time to HCHP. He volunteers at a clinic for the uninsured and serves on the hospital’s board and as chief of its medical staff. He also is a partner of his physician practice, Unity Physician Group. Stone and his wife, Karen Green Stone, who heads HCHP’s education committee, live in a home that Stone built outside Bloomington. Their home is unofficial headquarters for the state organization. He is finding many people who are willing to listen. Stone’s point that the United States already has a “single-payer” program in Medicare that covers millions seemed to make sense, said Henricks, whose company First Advantage has faced annual health insurance premium increases of 20 percent to 25 percent in recent years.